The Midnight Freemasons: Open the Gates of Hell! Open! Open! In the year 33 A.D. at approximately 3pm on a Friday in the Judean city of Jerusalem, Jesus of Nazareth gave up his spirit and ended his earthly life. He died after being crucified by the Roman authorities acting on the behest of the Jewish Sanhedrin. Soon after his death Jesus’ body was taken to a nearby sepulcher and laid to rest. From Friday evening until Sunday morning Christ laid entombed. The Gospels recount the events that took place after Christ’s death including the traditional account of the Christ’s Resurrection, however the Gospels leave few details about what Jesus’ spirit did while his body lay entombed. Christian tradition has held that Jesus descended into the underworld during his sojourn among the dead. The nature of his journey is debated amongst Christian theologians, however it is undisputed that he experienced death in the same manner as other mortals. The majority of Christian scholars accept the patristic teaching of Christ’s descent into the underworld. The New Testament epistles provide support for this position. The Apostles’ and Athanasian Creeds, the former dating conservatively to the 2nd century and the latter to the 5th, both contain references that state that Christ “[d]escended to the dead” (Lat. descendit ad inferos). Despite scant biblical support, these creeds include references to Christ’s descent into the underworld reflecting a deeper theological significance. The Epistle to the Hebrews 2:14 contains an explanation for this inclusion: “Since therefore the children share in flesh and blood, he himself likewise partook of the same things, that through death he might destroy the one who has the power of death, that is, the devil…” In short, Jesus’ travel to the underworld, Hades, or Hell has a significant soteriological significance. It explains Christ’s conquest over Satan and his chief power, death and torment in the afterlife. 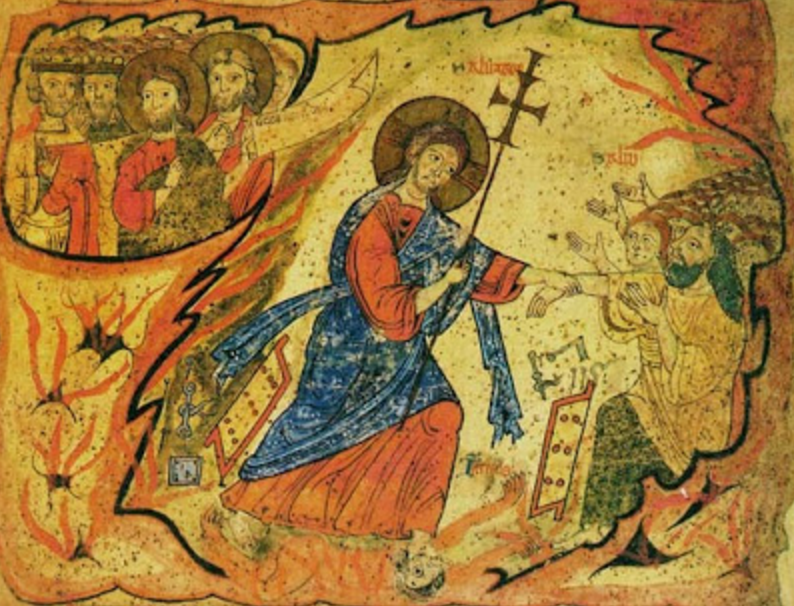 Jesus’ descent into the underworld is not unique and has parallels in many other cultures. The ancient Greeks called a descent into the underworld “katabasis.” Katabasis means “a going down” followed by a “going up.” If a resurrection (anastasis) does not follow the katabasis, it is a mere death not the more technical katabasis. The katabasis is characterized by an upper-world hero’s journey into the underworld to seek a quest-object or gnosis. The ability to enter the world of the dead and return is proof of the hero’s status above mere mortals. Examples of such journeys abound. In Campbell’s The Hero With a Thousand Faces he defines the “Hero’s Journey” as “[a] hero ventures forth from the world of common day into a region of supernatural wonder: fabulous forces are there encountered and a decisive victory is won: the hero comes back from this mysterious adventure with the power to bestow boons on his fellow man.” This journey follows a general pattern of departure, initiation, and return. In the departure phase the hero lives in the upper-world and receives a summons to go on a quest. At first the hero is reluctant to go on a journey, but is persuaded to go by a mentor figure. In the initiation phase the hero traverses a threshold to the unknown where he faces trials and travails. Eventually the hero reaches the “the innermost cave” where he must undergo “the ordeal” where he overcomes his main enemy. By overcoming the enemy the hero is transformed and received his reward. Once victorious, the hero must return to the upper-world. In the return phase the hero again traverses a threshold and return to the upper-world with the reward he gained in the initiation phase. The hero has now gone through an apotheosis and has obtained spiritual power over both the upper-world and underworld. This phase is of particular importance to our present study. While Jesus, Odin, and Conan the Barbarian may experience a liminal phase in a subterranean underworld, do we, individuals experience waking-life go through similar trials? One cannot say that everyone consciously goes through such a stage, however the spiritual journeyman will inevitably go through such a phase. This phase, as termed by Campbell, is initiation, the journeying inward and reconciliation thereof. Many people are familiar with the basic concept of initiation. A man is admitted into a fraternity and goes through a ceremony making him a member of that society. Beyond the ceremonial aspects there is a much deeper and significant facet of initiation. As in the ancient depictions of katabasis or Campbell’s “Hero’s Journey,” contemporary initiation endows initiates with gnosis enabling them to seek perfection in this life and the next. Initiation is not merely a ceremony but a lifelong endeavor, a journeying inward, a continual transformation and process of perfection. Modern initiates such as those following the path of Thelema and analytic psychologist Carl Jung have described this process and paved a way for our own initiations. In the canon of Thelema, the religion founded by Aleister Crowley, the connection between Hell and initiation is made abundantly clear. In Crowley’s Book of Lies it states, “There is no silence in that Abyss: for all that men call Silence is Its Speech. This Abyss is also called ‘Hell,’ and ‘The Many.’ Its name is ‘Consciousness,’ and ‘The Universe,’ among men.” The “Abyss” is the great gulf that demarcates the worlds of the Actual (the rational and emotional) and the Ideal (the Divine). In the system of Thelema the ultimate spiritual goal is to cross this Abyss and dissolve the subject-object distinction. To cross the Abyss requires the integration of the conscious and unconscious mind. It is to this end that the Thelemic system is aimed. Other Thelemic texts provide additional insights into the connection between the descent into Hell, or the underworld, and initiation. In Liber CDXVIII the writer states, “Then the Devil of the Æthyr, that mighty devil Choronzon, crieth aloud, Zazas, Zazas, Nasatanada Zasas.” This term is explained in Liber DCLXXI vel Pyramidos. Pyramidos is the reflection of the temple initiation given to Neophytes of the A∴A∴, the teaching order established by Crowley. Pyramidos reads: “Of Power–that Set-Typhon hath heard–SAZAZ SAZAZ ADANATASAN SAZAZ [Open the Gates of Hell! Open! Open!] (Pronounce this backwards. But it is very dangerous. It opens up the Gates of Hell. ).” Of unknown etymology, these are the words Adam, per tradition, used to open the Gates of Hell. The inclusion of the words commanding the Gates of Hell to open within the initial initiation ritual of A∴A∴ demonstrates the importance of the role of descending into Hell (i.e. the descent into the unconscious) plays in the framework of Thelema. The imagery of a descent into Hell found in an ancient epics, a multiplicity of fables, and modern tales is not merely the product of chance, but according to the psychologist Carl Jung, a product of the Collective Unconscious. As the archetypes of the Collective Unconscious thrust themselves onto the conscious minds of the ancient Romans, those experiencing this phenomenon were generally incapable of understanding what was being required of them. As J. Daniel Gunther, an Aspirant of the A∴A∴, wrote in his Initiation on the Aeon of the Child, “The archetypal power that indeed threatened the entire world was requiring nothing less than the descent into Hell: the unconscious of man himself.” Jesus took on the requirement of descending into Hell and became an amulet against the archetypal powers that threatened to possess everyone. We are called to the path of initiation. Jung and the scriptures of Thelema describe this process as self-sacrifice, which is the journey inward. The uniting of our conscious and unconscious mind annihilates both resulting in an integrated psyche greater than its parts. This study has presented a brief overview of the relationship between the allegory of descending into Hell and the concept of initiation. Hell is the unknown reaches of our own minds. It is the wilderness in which Christ sojourned for 40 days and which the Children of Israel traversed for 40 years. Satan tempts us there, and we must kill him by recognizing him, devouring and digesting him. This "Satan" is the iner self, not the "Satan" of the Bible. If you seek the Great Work, the Summum Bonum you must undertake the journey of self-sacrifice and redeem yourself from the jaws of Hell. Bro. Lance Kennedy is a member of Jewel P Lightfoot, GL of Texas, The Harvard Lodge, GL Massachusetts, Dallas Scottish Rite, Love Field C&C, and a Full member of the Texas Lodge of Research.